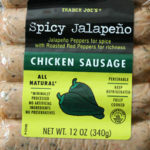 I buy this particular type of Trader Joe’s chicken constantly. Definitely the best chicken of theirs that I’ve tried, and some of the best packaged chicken that I’ve bought from any store. The perfect amount of seasoning – light enough that you can add your own for specific flavors, but deep enough that you don’t need to. Goes great in stir fries, on pizzas, and any other typical chicken use. I’m really picky about chicken and prefer to marinate and cook my own. But these are great to have on hand for last-minute dinners. Throw some in a pan with chicken broth, salsa, black beans, and garlic, along with a fast-cooking grain like couscous, and you have a delicious dinner in just minutes. Definitely recommend. 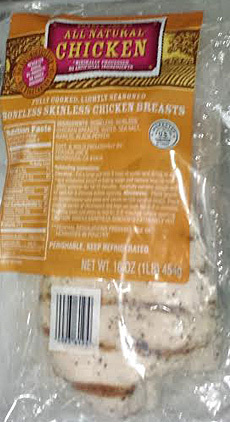 This is the best tasting pre-cooked chicken I’ve tried. Really great on salads and in quick dishes! 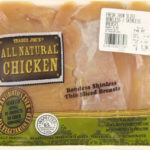 I eat this chicken a lot in a variety of meals (salads, stir-fries, etc) — great price and great taste and texture! 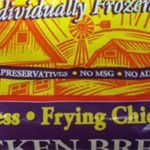 Hands down the best pre-cooked, pre-packaged chicken. It is flavorful, moist and perfect every time. It does NOT have a preservative aftertaste. 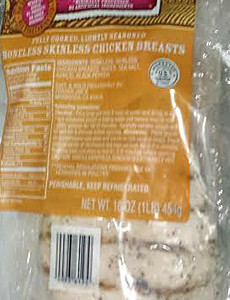 Also, it is much better than the “Just Chicken Breasts” that are sold in trays. I used this during the week for quick lunches – atop salad or along with steamed veggies. At $7.99 for a bag of 4, it is a bargain ($2/each!). Enjoy! So happy I found this! 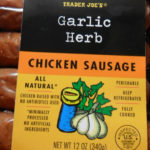 And surprised, since some of Trader Joe’s other chicken really doesn’t do it for me and ends up tasting dry and unappetizing (as another reviewer mentioned, the Just Chicken). Not this one! It’s never let me down, and I buy/eat it weekly. 1. It’s nice to heat up a little in a pan with some olive oil, but since it is already fully cooked, only keep it in there for a short time otherwise it will get too tough/dry. 2. It’s best when cut into pretty small pieces (not like ‘shreds’ but cube-size). 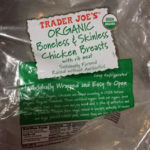 Best quality precooked chicken breasts I’ve ever bought! 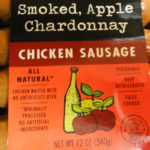 Moist and juicy and tender, without the artificial/rubbery feeling of a lot of other brands. I like the amount of salt and pepper on them as well. Only minor complaint is some of the chicken breasts have this annoying gelatinous film on them when you remove them from their individual packaging. Was so excited that I found something inexpensive and quick for my lunches. I will say the salt is almost overpowering.